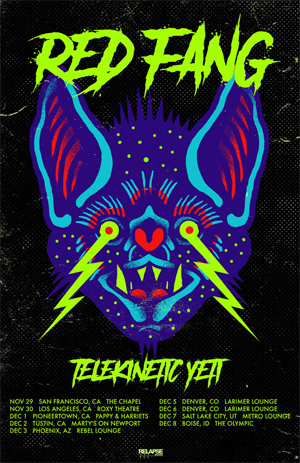 Portland, OR rockers RED FANG announce additional end of the year tour dates with TELEKINETIC YETI. The tour begins November 29th in San Francisco, CA and ends December 8th in Boise, ID. Tickets are on sale Friday, September 7th at 10am local time. RED FANG has also been confirmed as the new headliner for Slaughter Que 2018 on October 6th in Atlanta, GA. All confirmed tour dates are available below. Additionally, RED FANG have shared a cover of the 1978 cult hit “Listen To The Sirens” originally performed by Gary Numan’s TUBEWAY ARMY. Watch the official music video directed by Ray Gordon on KNAC.COM HERE. The music video, which is a departure from RED FANG’s usual antics, showcases the band playing the song in their rehearsal place while taking in the sites and sounds of their hometown, Portland. RED FANG begin their US Fall headlining tour, sponsored by Kerrang!, next week with support from BIG BUSINESS, MONOLORD (select dates), and DEAD NOW. RED FANG has also announced a string of New Year’s Eve shows in the Pacific Northwest. Select dates with THUNDERPUSSY, R.I.P., WIZARD RIFLE and GAYTHEIST.